N'Sign International Ltd is a web design and website management company based in Somerset, England. The services we provide include custom web design, search engine optimisation, website assessment, domain name registration, and a variety of web hosting packages. 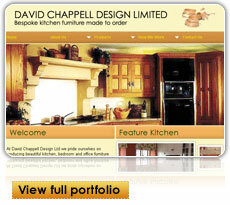 David Chappell Design Limited is a furniture design company which has a reputation as builders of high quality bespoke furniture. They wanted a contemporary redesign of their existing website that still reflected their traditional values. They also needed to be able to update the content themselves. To see more of this site and the rest of our current portfolio click on the ”View full portfolio” button. © N’Sign International Limited. All rights reserved.